Within every aspect of healthcare, time is considered the most valuable component. Even minutes of delay can result in the loss of a life. Early diagnosis lies at the heart of healing patients and timely execution of treatment is of primary importance. At an average, doctors spend 15 minutes with each patient, which when considered intently, is grossly insufficient in providing a comprehensive diagnosis of the illness. In an ideal situation, a diagnosis should be made after careful consideration of all relevant patient information, including similar cases and demographics. As the healthcare industry gradually moves toward an AI-driven world, things that were previously considered a hindrance or unlikely are now fairly simple tasks. Over the years, more than 90% of hospitals in the county have moved from paper-based systems to electronic processes. When it comes to medical diagnosis, patient’s records are of primary importance. Risks towards critical illnesses can be caught through predictive analysis, thereby saving lives and costs. Early diagnosis is no longer a distant hope, but an actuality that can be easily accomplished through advanced systems. What is AI Transformation in Medical Diagnosis? In a nutshell, adoption of technology that will assist the process of medical diagnosis through automation, prediction, etc. is referred to as AI transformation in medical diagnosis. Recently, many technology firms are looking to create systems that reduce the time between tests and treatments. This is done through automated and speedy mining of medical records with results of suggested treatments. Furthermore, there are predictive analytics platforms being developed, which uses machine learning to predict mortality. Within this technology, there are features that keep doctors in the loop with patient behavior, such as the patients that are likely to skip appointments and be irregular with their medication, their likelihood of readmission, risk of hospitalization, etc. AI technology also allows patients to easily reach out to doctors for notification of new symptoms. Through machine learning and advanced algorithms, conditions can be detected at a rate that was previously considered impossible. 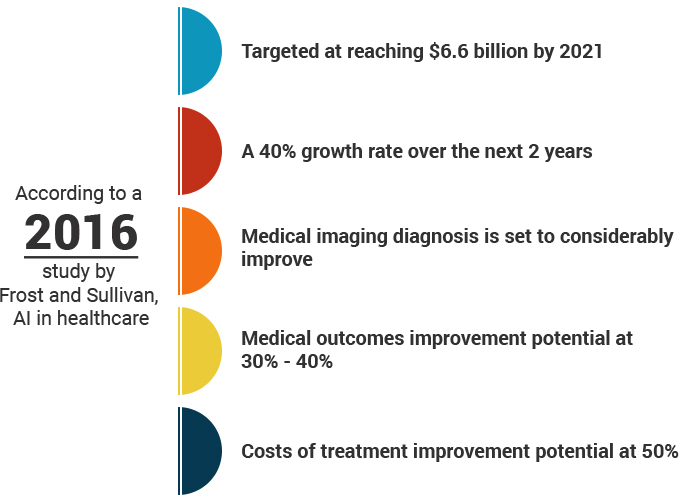 How Important is AI Transformation in Medical Diagnosis? Providing doctors and physicians with technology that allows them to tap into the collective knowledge of other doctors and millions of patient records is a luxury no healthcare organization would refuse. With the advanced systems out there, access to these records is fully automated (based on relevance) and is undertaken within seconds. The potential of such a technology cannot be undermined and this is just one of the many features that AI brings to medical diagnosis. It is like a virtual personal assistant that offers doctors recommendations based on similar cases and the treatment provided. Although artificial intelligence doesn’t have the ability to replace doctors and physicians, it has the capability of mining data, performing analytics and identifying patterns that is fairly impossible for humans to execute. When these technologies are used by skilled physicians and doctors, the medical diagnosis process is multiplied ten-fold quality-wise. The high costs involved in accessing superior quality data, developing models for intelligent analytics, pattern identification, training of algorithms, etc. Due to the scattered nature of the software, many healthcare agencies find that their models are incompatible with others. This causes more damage than good due to inefficient electronic medical record-keeping and a lack of comprehensiveness. Due to security reasons, many of the systems are kept away from the internet, making information sharing and access of data impossible. It defeats the entire purpose of electronic information since it is not easily accessible. Many medical practitioners are wary about these technologies since they view them as an encroachment into a doctor’s turf. The recommendations of these technologies might take doctors away from their instinctive diagnosis, which is their area of skill. Doctors and hospitals are increasingly leaning on intelligent systems and processes to identify patients who are at a risk for kidney failure, cardiac disorders, post treatment infections and hospital readmissions. Electronic health data, compounded by public database information serve as a powerful resource towards diagnosis and suggested treatments. Medication suggestions are provided based on popularity among similar case histories, success rate is determined through patient outcome records, and a plethora of research can now be made available within seconds. Furthermore, certain medications are ineffective on certain people, and AI systems carry the potential of highlighting this to the doctor at the time of prescription. The analytical systems are also capable of catching anomalies in patient records. For example, if a patient claims that they don’t consume alcohol, but they display signs otherwise, the system can catch this and highlight it to the relevant doctor. Through a concept called deep learning, these intelligent machines, use a wide range of sample data to form algorithms that are meaningful in their approach. The automated nature of these machines allows them to create analysis that is impossible for the human brain to process. Hence, these machines work extremely efficiently to assist doctors and physicians. Step 1: The first step in the process is to familiarize the healthcare agency with the benefits and capabilities of AI. This will create a fair idea of the specific requirements of the agency and the relevance of AI for those specific needs. Step 2: Once the agency has familiarized itself with the capabilities of AI, the next step is to identify the gaps of your personal organization. An analysis of the areas that need to be addressed will keep the focus on the problems that AI is intended to solve. The value of AI should be clearly visualized with respect to the specific needs of the healthcare agency. Step 3: The next order of business is to focus on the business priorities and conduct an analysis that weighs the value of adopting AI with relation to the cost of implementation involved. Every investment should be directly tied to the business value it brings to the agency. 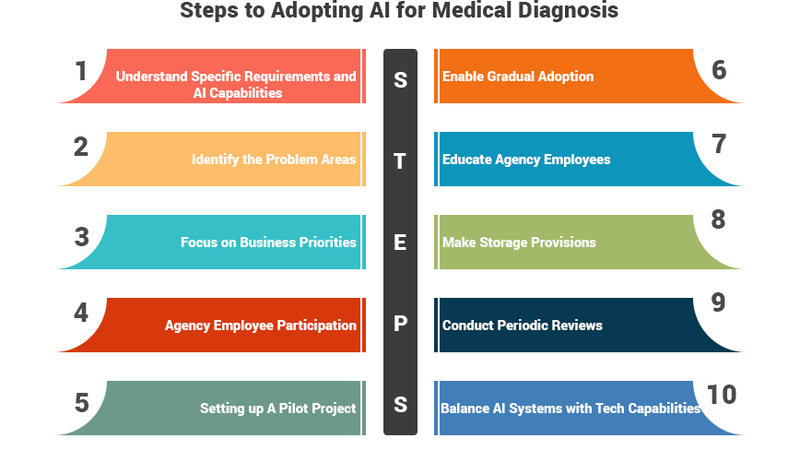 Step 4: Create provisions among the employees, nurses and physicians to familiarize themselves with the available technology and participate in offering suggestions towards AI-adoption. Very often, they can point out to hindrances and advantages that may have been overlooked. This is because they are deeply involved in the everyday workings of the agency. Step 5: Once the groundwork has been established, it is time to identify the developers that offer the specific solutions and set up a pilot project. Establishing clear timelines for the pilot projects and the subsequent executions is crucial to success. Step 6: Assign a small team of people that will periodically educate the healthcare agency on the systems being incorporated and the manners in which they can be used, along with the advantages they provide. Doing so in a periodic fashion allows the doctors and administrative staff to start using systems at close and regular intervals. Step 7: Take gradual steps toward AI transformation rather than a complete revolution. This will assist the doctors, nurses and administrative staff to gradually adopt and familiarize themselves with changing systems. A sudden drastic transformation may seem overwhelming for the organization. Step 8: Storage, whether it is of patient data or intelligent algorithms, is an important component of AI adoption. 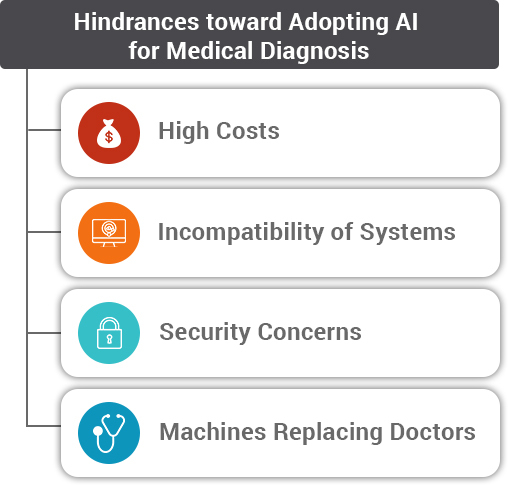 Every healthcare organization that is looking to make the move towards AI needs to make ample arrangements for storage requirements. Step 9: Conduct periodic reviews with the developers that involve a display of the work in progress and the technologies already adopted. These reviews ensure that the AI being deployed is in line with the original agreement and providing the value that was originally envisioned. Step 10: Maintain the balance between the developing AI systems and the capabilities of the technology. This will eliminate the risk of disappointments, wherein the agency later discovers that the technology is not living up to what it was intended for. 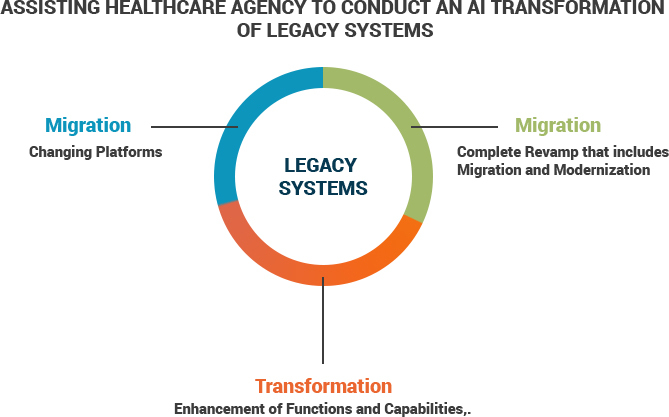 Migration: This is one of the simplest moves that a healthcare organization can make to their legacy system. It essentially involves moving the system from one platform to another, generally more effective. The functionality and design of the system remains the same and generally the speed, cost, etc. is improvised. Modernization: This is one step ahead of migration and involves an enhancement of the capabilities and functions of the system. This does not involve moving the legacy system to a different platform and the capabilities are modernized and upgraded. The functionality is improvised. Transformation: This is a process that involves both migration and modernization. AI transformation involves a complete revamp of the legacy system, where a small component of the system is left behind at most. Platforms are changed, functionality and capabilities are enhanced. The future looks very promising when it is viewed in line with the AI capabilities toward medical diagnosis. 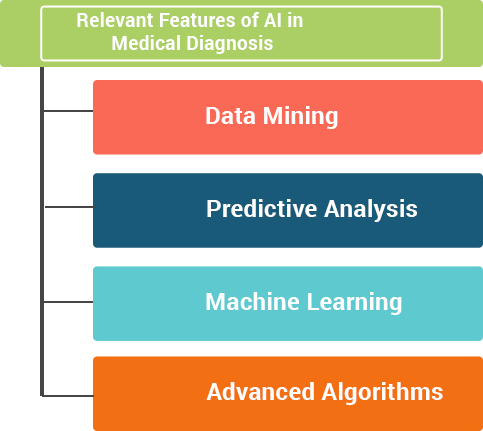 Whether it is machine learning, intelligent algorithms, automated data capabilities, and predictive analysis, there are several avenues of AI that can considerably boost the medical diagnosis process.